Cop Watch app records police-citizen interactions | C.O.B.P. When Sammy Yatim was gunned down by police on a Toronto streetcar last summer, the whole world could witness it on YouTube. Last year, a St. Catharines man recording a Toronto tourist being arrested in a takedown he deemed as involving “unnecessary force” was himself taken down — an act caught on a security video. During the 2010 G20 Summit protests in Toronto, countless YouTube clips were posted. At least one, depicting the police attack on Adam Nobody, resulted in a 45-day jail sentence for Const. Babak Andalib-Goortani. 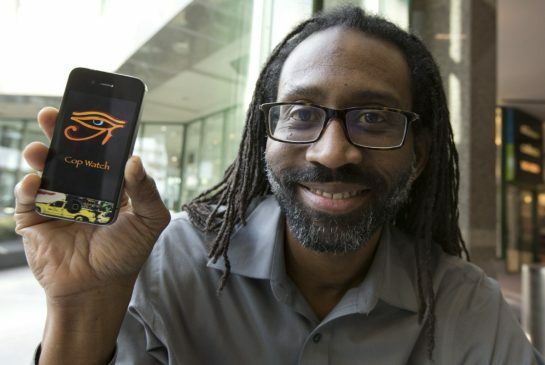 But well-publicized incidents such as these are not what inspired professional app developer Darren Baptiste, 46, to create Cop Watch Toronto , which was released last week on iTunes. The app, which costs 99 cents, is not a new concept. In the U.S. last year, similar apps, such as “ Stop and Frisk Watch ” for New Yorkers, have been released. Although the aims are the same as Cop Watch Toronto, the operation is not. What Cop Watch does is begin shooting automatically once it’s opened, and as soon as recording is stopped, instantly uploads to YouTube. At the same time, an email is sent to the community-based Network for the Elimination of Police Violence , with the videographer’s location and an URL for the video. Baptiste, who put together Cop Watch Toronto with the network, said he had the idea years ago. But he was reluctant to actually launch it until he felt it would be properly understood and used. That confidence came at a workshop held at the Ontario Institute for Studies in Education last November. Titled “Do I have the right to film the police?” it featured legal experts and community activists discussing every possible scenario. The app’s icon features the ancient Egyptian “ Eye of Horus ,” which symbolizes protection and is meant to ward off evil. And that can work two ways. According to Toronto police spokesman Mark Pugash, rapidly evolving video technology can catch cops in illegal acts, but can also serve to help solve crimes. There is nothing that legally prevents Canadians from recording police activity, so Baptiste’s app also includes reference documents just in case citizens need to bone up on their rights. “An app like this seems to be a reasonable response to this: wanting to document the actions of public service while minimizing the possibility that someone will be able to compel the videographer (to delete) the footage,” said Halifax-based lawyer David T.S. Fraser, an expert on privacy law. Baptiste, whose background is mostly in game and business apps, calls Cop Watch Toronto “the most important” he has ever created.